Earlier this week I gave a lunchtime seminar at the University of York to the Science and Technology Studies Unit. 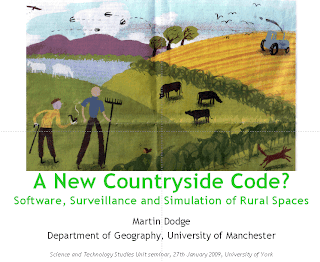 The title of my talk was "A New Countryside Code? Software, Surveillance, Simulation of Rural Spaces". If you are interested the slides are available here. I've done a book review of Safeguards in a World of Ambient Intelligence (2008) for the journal Surveillance & Society. David Wright, Serge Gutwirth, Michael Friedewald, Elena Vildjiounaite and Yves Punie editors (2008) Safeguards in a World of Ambient Intelligence. London, Springer. 291pp. Hardback $159.00 (US), £91.00 (UK). ISBN-978-1-4020-6661-0. I have been co-editing a theme issue in the journal Geoforum with Chris Perkins. The title of is 'The view from nowhere? Spatial politics and cultural meanings of satellite imagery'; it emerged from sessions we organised at the AAG conference in 2007. We hope the full theme issue will be out officially by the end of the year. Received 16 October 2007; revised 4 September 2008. Available online 24 December 2008. This paper argues, following Friedrich Nietzsche, that recent evaluations of Google Earth uncritically privilege the product’s Apollonian determinations at the expense of its Dionysian uncertainties. Specifically, when we understand Google Earth as a virtual globe composed of surveyed panoramas, sober rationalization, dystopic control, and transparent order – or, even, as a tool for participation and empowerment – we undersell its capacities as an alluring digital peep-box, an uncertain orb spangled with vertiginous paranoia, frenzied navigation, jubilatory dissolution, and intoxicating giddiness. We argue that the former interpretations not only risk foreclosing our theorizations about how Google Earth is actually used in various ways and different contexts, they also reproduce a one-dimensional and conservative reading of technology that can be traced back (at least) to the writings of Theodor Adorno. By drawing on the work of Walter Benjamin (Adorno’s critic and pen pal for more than a decade) we aim to ‘go beyond Apollo and Adorno’ by illustrating the extent to which Apollonian order and Dionysian love makes Google Earth go round. To do this, we examine Google Earth as a “digital peep-box” with an online collective that revels in its “Spot the Black Helicopter” competitions; illuminated profanities; alien and giant insect invaders; naked sunbathers; and crashed transport planes in Darfur. Research in the history of science and technology increasingly accepts the need for ethnographic approaches to the construction of knowledge, which follow key actors in the process, and also trace the inscriptions they leave behind (Latour 1987). Geographers have only recently begun to explore their own knowledge communities in this way (see for example Barnes 2004; Livingstone and Withers 2005), reflecting critically on the contextual significance of place, and the political significance of historical processes in our making and imagining of spaces. But the discursive power of narrative in the construction of particular geographical imaginations has long been recognised (see Gregory 1993). This session seeks to bring these two approaches together to deepen our understanding of the processes underpinning spatial knowledge claims, by marrying storytelling to a critical and contextual emphasis on why geographers make, and have made maps. And equally why some geographers don’t make maps anymore. Last year’s conference included well-attended methodological sessions focusing on maps that matter to geographers but little is known about why mapping might be deployed across different areas of the discipline, or about the reasons for changing relations between cartographic practices and geography. We invite papers that focus in a critical way on this relation, and tell particular and positioned stories about the strongly contested, ambiguous and fluid links between representational practice, image use, technologies of production and learning with mapping in the academy. We are interested in new insights into what geographers do and how geographical knowledge emerges. Tell us your local mapping story!